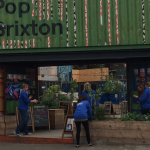 Our “hub” in the vibrant container village at P OP Brixton is taking shape. This will provide us with a functional, much needed accessible outreach space for people to drop into and use computers, access information, meet colleagues and get jobs. We are raising funds to get it up and running and hope to be there soon. We were thrilled to once again welcome 8 enthusiastic employees from William Morris Entertainment/IMG for their global, annual “Walk the Walk” volunteering day. 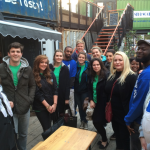 This year their day was spent at the vibrant POP Brixton where we are soon to take the container which will be our hub in the community. 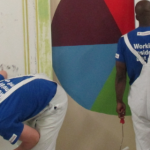 The day was all about helping organisations already resident at POP and was therefore very diverse. Starting with garden landscaping with Uncommon, followed by an introduction to the Brixton Pound they then pulled on the dungarees to paint a container. A quick break then time for a Q and A session with some young budding talent at Reprezent Radio. The feedback on the day was really positive and we are flattered to be so sought after as an organisation for these day. With so many exciting things going on we took stock at an away day. Facilitated by David Hall-Matthews we evaluated where we were and looked at the future. 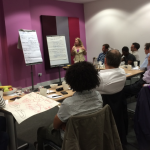 With support from Walgreens Boots Alliance the day was held in Kings Place and quite miraculously the entire team attended. 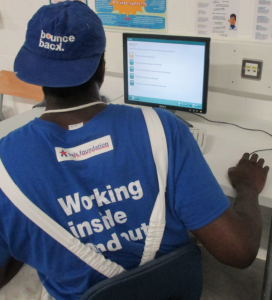 The recent launch of Bounce Back’s dry lining centre training Brixton prisoners in a much needed skill by London’s hugely growing construction industry shows not just how much employers are stepping up to engage and employ prisoners on day release and then when their sentences are complete, but also shows how much more can be done in this vein. Brixton of course also houses The Clink restaurant where inmates have been given day release opportunities at my Borough Market restaurant Roast and indeed some have gone on to secure full time employment to much success – so much so that one was recently “poached” to work at another restaurant. Annoying and satisfying at the same time. 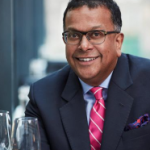 The hospitality sector is very well skilled in complaining about the lack of skilled candidates coming forward to fill our vacancies; we’re less well skilled in attracting people to us. My interest in prisons and engaging with ex-offenders started eight years ago when I was asked to lead a “Seeing is Believing” tour for Business in the Community to Wormwood Scrubs where I got to visit the kitchens. Inmates cooked up to 200 meals a day without ever being told that they were developing a skill. It was just a task to them. Even dafter than that was the response I was given as to why there was so much empty space in the kitchen. There used to be a butchery in one section but now they bought in pre-prepared meats and there used to be a bakery but now they found it easier to buy in sliced bread. I don’t know about the skills shortage issue among candle stick makers, but butchers and bakers are desperately looking for people to help grow their businesses. Every chef I know would love to have their own baking section and buy whole carcasses but London restaurant space comes at such a premium that for most it’s a luxury they cannot afford. Relying on prison authorities to join these dots themselves is fanciful. They have their hands full with enough day-to-day issues and are facing cuts all the time. Only a few governors, like Graeme Hawkins at Isis, take pastoral care to ensure prisoners leaving them find a job and do not return as most tend to do. I imagine there are acres of empty building space in our prisons which businesses could be putting to good use, just as happened with the dry lining centre. Bad Boy’s Bakery, also in Brixton and set up famously by Gordon Ramsay, was a good step in that direction but it was ancillary/unconnected to his core business. If restaurants could team up with butchers and bakers to become an essential part of our procurement programmes we would become committed to the process and ensure its success and longevity as it would be in our commercial interests to do so. We could get a delivery line not just of produce we require but also of skilled people we could then put to work in our own kitchens when they were released. 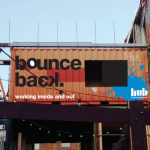 Bounce Back could help design and build the spaces. And talking of spaces, watch this one for what happens next. The first 5 are through! The dry lining centre has been looking at bit busier than this of late and we are delighted that our first 5 participants have completed the course. What is more exciting is that they have all had in custody interviews which could lead to work using this skill upon their release which is imminent. We are in the logo! 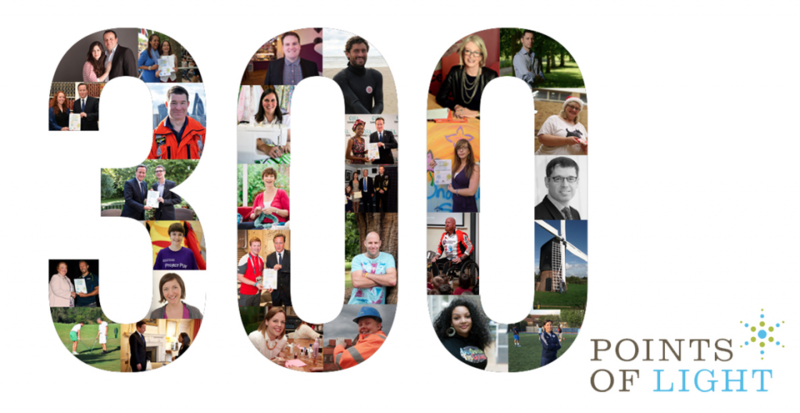 Today the Cabinet Office celebrates its 300th Point of Light! they have designed this graphic. Look carefully and following her award earlier in the year Fran has made it onto the image! Top left of the 2nd zero! We are always grateful to a partner for taking ownership of a tangible item and the T shirts currently used in our training centre were funded and co- branded by Axis. Furthermore director Joe Ibrahim visited the centre to deliver a truly inspirational talk to the guys who thoroughly enjoyed the fantastic illuminating morning giving them the drive to aspire to a job on release. 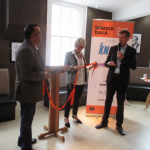 It was brilliant to return to the Clink Restaurant a year on for another fabulous breakfast launch party to officially open our Dry Lining Centre. The wonderful Tom Watt hosted the event and interviewed one of our long standing cohorts, Tremaine who has been through both our courses. 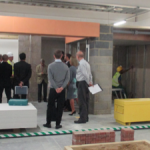 Over 100 attendees toured both centres and heard from Val Lowman (Be Onsite) and Debbie Akehurst (Land Securities) how the vision of training to fulfill a construction industry skill shortage has become a reality with the opening of our centre. is an exciting progression in line with our objective of effectively training offenders with skills that are relevant for positioning them well for entry into the construction industry workforce on release. Our new Dry Lining Training Course has now commenced in HMP Brixton with participants embarking upon the introduction and theory side pending final completion of the bespoke training centre. 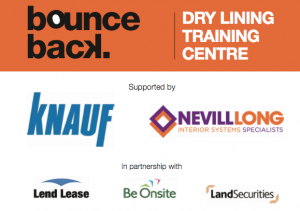 This is the first time a Dry L ining course will run in a London prison in part due to the practical logistics of transporting the vast amounts of materials required and also the cost. Thanks to some phenomenal support from Knauff and Encon and others featured here it has become possible for us to open the centre and offer inmates of Brixton the opportunity to learn this sought after skill. 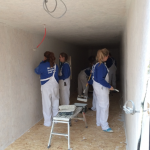 The programme is targeted to train 70 participants per academic year and offers those referred whilst in custody the opportunity to participate in the CITB C Skills course in Dry Lining to Diploma Level 2. 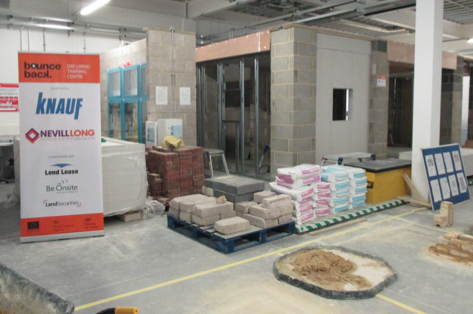 Having gained a construction skills qualification whilst in custody, cohorts are well positioned to enter the construction industry work force immediately upon release. This is a major step in bridging the gap from prison to employment as we are further supported by construction industry partners. Congratulations to Tremaine on his job appointment with Measom. Tremaine went through our training course in July of last year in HMP Brixton and went on to work with us whilst on ROTL. In conjunction with ourselves and our partners Land Securities and BeOnSite he has steadily progressed whilst working on sites and has recently completed the SBWA (Sector Based Work Academy) at City of Westminster College. We are delighted that his dedication has been rewarded and he is a wonderful example of a participant really maximising the opportunities from start to finish that we offer. From training in custody, he then went through the voluntary work process, worked with us and our partners on some big sites as a ROTL team member, received further training to gain extra qualifications to ultimately achieve a job opportunity with a major construction group. It is fantastic to see such examples of our complete offering being fully utilised. We really wish him all the best.